The results of our 2015 Women in Sport Leadership Survey are ready and unfortunately they do not look too good. 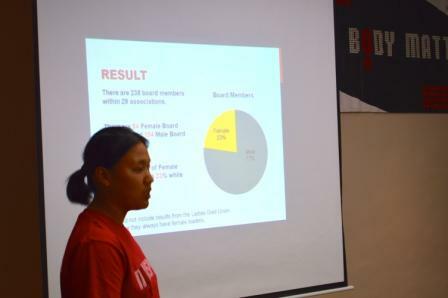 The results were presented at the Women’s Sport Leadership Network Seminar by Ms. Aya Noguchi who led the Survey exercise for the 2015 edition. Unfortunately, the percentage of female Board Member has declined 9% since 2014. The result shows that there is a big gap between men and women in decision making positions in sports. Even though some of the organisations have made effort to promote women at leadership position, the progression has not resulted in change to meet national policy requirements for at least 30% representation. ‘With this set of data, there is an opportunity for us to ask more questions and research further to find out what is happening.’ Ms. Noguchi said. NOWSPAR conducts this survey to establish the extent to which women are being represented on the boards of National Sports Federations. Over the years, the trend has been that leadership among women in Sports federations has been generally low. This year’s survey was comprised of 29 sports federations. Read more here to see the data and compare with past survey.